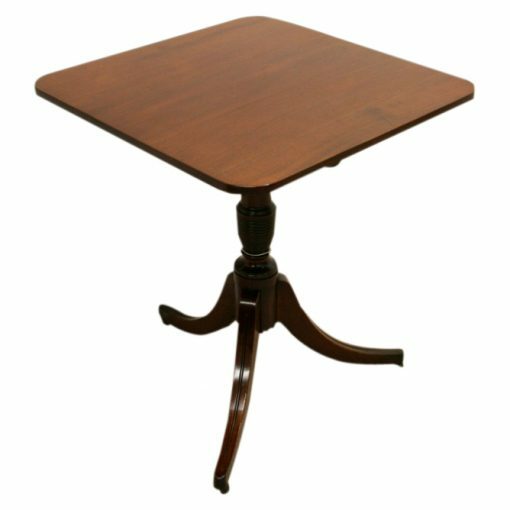 Circa 1825, George IV mahogany snap top occasional table. The square top has rounded corners. Beneath this is a spring loaded metal clasp locking device. The block is solid mahogany and has the stem protruding through. Beneath this is a solid turned column with a ribbed beehive in the centre above a circular shaped bezel. The whole piece stands on four elegant splayed legs with nice fluting and ribbing in the centre. Finishing on squat brass and leather feet which rotate. 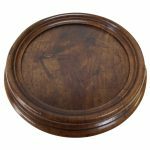 The table retains its original colour and patination, and is very stylish and sturdy. 70cm high x 63.5cm wide x 62.5cm deep.